Do you own a modpack or a small server? Want to make your modpack or server look more professional? Want specialized mods made specifically for your pack/server? Then mod is for you. Custom codex is a small mod that will give your user a book when they join a world. These books are generated through a series of configuration files and allows for you to create personalized books for your users. This mod allows for a custom book name, author and page text and supports the minecraft formatting codes allowing for text to be colored, obfuscated, bold, scratched out, underlined or italic. Custom Server is a small mod that will add a server to the users server list when they log into the game. This can be used to help preserve the users existing server file when installing your pack. The server is generated using a configuration file and can be used to generate a server entry with a custom server name, ip and port. Server name can be customized with custom colors and formatting for the server ip will cause the ip not to work. Custom Branding is a small mod that allows for the customization of the branding options in the minecraft main menu. With this mod you can add customized text to the main menu on the left side of the screen where forge states how many mods are installed. 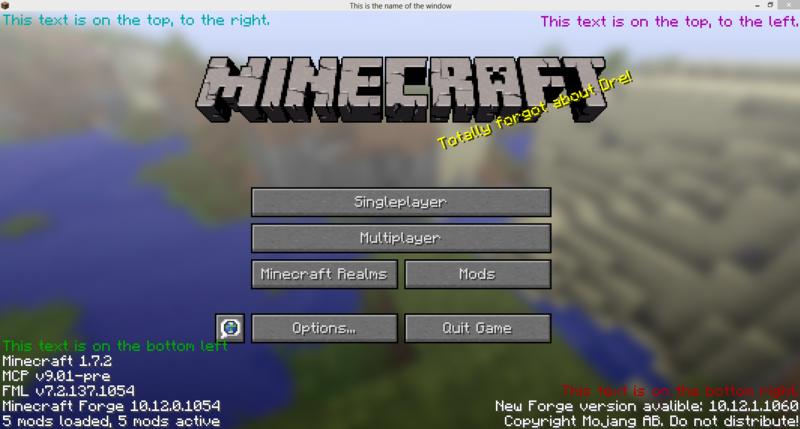 It also allows for text to be added to the right side of the screen above the Mojang copyright text. This text can be changed using the minecraft formatting codes and allow for colored, bold, italic and several other options. Minecraft formatting info can be found here.